You want to wear a stylish sleeveless blouse, shorts or skirts however those stretch marks, also known as striae, do not let you. A question keeps popping in your head - "How to get rid of stretch marks?" You don't need to rely on those expensive products. Natural way is the best to get rid of these marks. Below you will find some effective tips and herbal remedies that have already helped thousands of people to make their skin better. Keeping the skin moisturized at all times stimulates the collagen production. The result is lesser and fading striae. Cocoa butter is a non greasy moisturizer that prevents and reduces stretch marks. It is cheap and you can get it in any shop. In fact, cocoa butter is one of the best ingredients and many popular products contain it. Coconut oil is easily found in supermarkets. 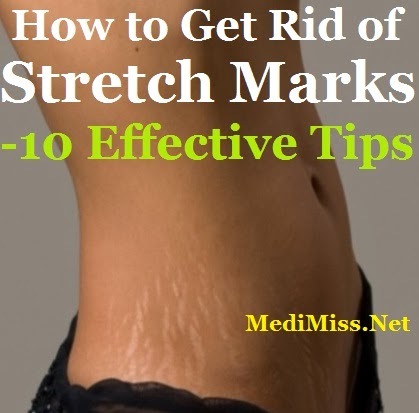 It is the most inexpensive way to get rid of stretch marks. Regular application of coconut oil works wonders. Vitamin E - Available at local druggist removes stretch marks rapidly. Regular application of shea butter stimulates the elasticity and fades the stretch marks. Massage olive oil on the affected area and it will take care of the rest. Lime juice has skin lightening properties. Mix lime juice, sugar and olive oil. Massage it on the striae. Eat right. Make sure your diet contains a balance of Vitamin C, Vitamin A and proteins. Keep skin hydrated. Drink plenty of water. It will make your skin more elastic. Exercise. Regular exercise improves the blood circulation and tones the body which will take care of stretch marks to a large extent. These 10 tips are very simple, however, if you use them properly you will soon notice how you striae disappear. Just do not give up if you do not see instant results. Continue following the steps above and you will achieve your goal. Above all, it is always better to prevent the problem than solving it. Ensuring that our body is well hydrated and keeping a healthy diet prevents overstretching of your skin.In case of pregnancy, it is better to start the care regime before marks start appearing. Regular application of Cocoa butter, coconut oil or olive oil hydrate the skin and help it to stretch without leaving harsh marks. Anyway, now you know how to get rid of this nasty problem. Hope these simple tips will you make your skin better and smoother. Good luck!